uuid : dcaa442c-fda0-4f9c-848e-ce372ddb9b49 templates_id: 119460 templates_uuid: "b9e85a12-6d06-4dbf-b482-798e39d42682" title: "Office sharing agreement - Office rental agreement template - Share your office" display_name: "Office sharing agreement" meta_keywords: "Office rental agreement and Office space rental agreement" description: "
If you have spare workstations in your office, licence these out to other businesses using this office sharing agreement for useful and lucrative results. This shared office space agreement will put things on a formal footing and includes details of the workstations to be used, the period for which they are available and the licence fee payable for the specific shared office. An office sharing agreement is an agreement between an owner of office space and another business. It can be used where the provider of the space owns the property or has a lease of the property. Why do you need an office sharing agreement? Rent or operating expenses for office space can be one of the most significant costs for a business. This office sharing agreement allows you to bring in another business to share these costs by granting them use of a \302\221workspace\302\222 within the property. Is this a type of lease? The office sharing agreement is not a lease, it is a contractual licence. The key difference is that a licence does not grant rights over a defined and fixed area. This agreement provides the sharer with a set number of workstations but does not specify their location. The \302\221provider\302\222 is the person who is granting the right to share. The \302\221sharer\302\222 is the individual or company sharing the office space. If there is more than one sharer, each must be named to ensure they remain and joint and severally liable under the agreement. There can be a maximum of four. What if you do not own the property? If you hold the property under a lease, check carefully for any clauses that would prevent or restrict sharing with another business. If landlord\302\222s consent for sharing is needed, this must be obtained before completing this agreement and allowing the sharer to move in. Will a plan be attached showing which workstations the sharer will use? You do not need to attach a plan to the agreement but if one is attached it must only show the initial location of the workstations. You must retain the right to alter the location of workstations to ensure that the agreement is not interpreted as a lease, rather than as a licence. You\302\222ll need to determine the amount that the sharer must pay for the space. Under the agreement, the sharer must pay any VAT due on the licence fee. The licence fee can be a weekly or monthly figure and the agreement covers the situation where the agreement starts mid-way through a month. For example, if the sharer moved in on 15 March the payment would be half the monthly figure for the period up to 31 March with the next monthly payment being due on 1 April. Will the licence fee be all-inclusive? The licence fee can be inclusive of the costs of services (e.g. internet, photocopying, reception and secretarial services) and towards utility bills. Alternatively, you can charge a licence fee and demand additional sums to reflect a contribution towards the cost of any services and utilities. The agreement runs for a specified period unless it is terminated by either party on notice and you must include a start and end date.
" created_timestamp: "2018-10-08 04:36:05.0" modified_timestamp: "2018-10-08 04:36:05.0" active: true created_by: 157 modified_by: 157 dcm_id: 222 url_slug: "Office-space-sharing-agreement" meta_description: "Create an office sharing agreement to rent out your spare workstations with simple guidance from Rocket Lawyer. Licensing out additional office space to other businesses can be both useful and lucrative. Try this shared office space agreement." time_to_complete: "20 minutes" role1: "Provider" role2: "Sharer"
Rent or operating expenses for office space can be one of the most significant costs for a business. This office sharing agreement allows you to bring in another business to share these costs by granting them use of a workspace within the property. The provider is the person who is granting the right to share. The sharer is the individual or company sharing the office space. If there is more than one sharer, each must be named to ensure they remain and joint and severally liable under the agreement. There can be a maximum of four. If you hold the property under a lease, check carefully for any clauses that would prevent or restrict sharing with another business. If landlords consent for sharing is needed, this must be obtained before completing this agreement and allowing the sharer to move in. Youll need to determine the amount that the sharer must pay for the space. Under the agreement, the sharer must pay any VAT due on the licence fee. The licence fee can be a weekly or monthly figure and the agreement covers the situation where the agreement starts mid-way through a month. For example, if the sharer moved in on 15 March the payment would be half the monthly figure for the period up to 31 March with the next monthly payment being due on 1 April. More than just a Office sharing agreement template, our step-by-step interview and guidance makes it easy to create your document. Easily create online, download, print and sign your free Office sharing agreement in minutes. 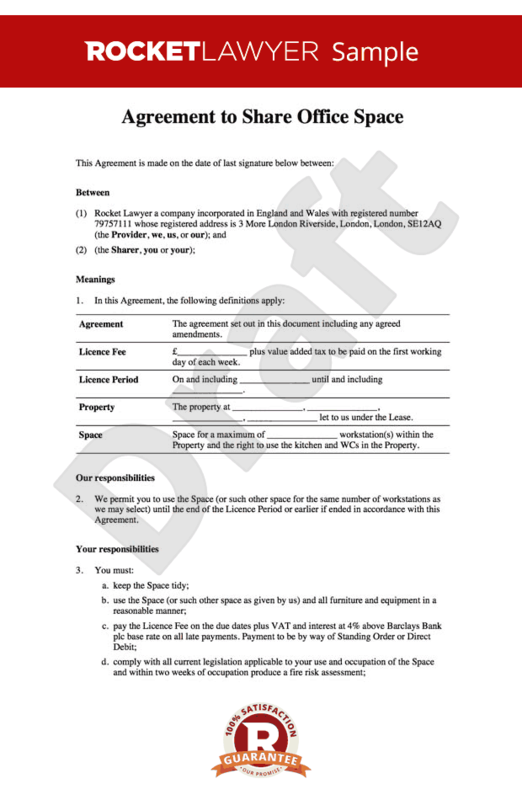 This document is also sometimes called: Office rental agreement and Office space rental agreement.